When a previous client moved into a new property, the first company he approached for his new kitchen was obviously LAcewood Designs. Instead of just designing the kitchen, we were charged with managing the whole project – installing a new kitchen and appliances, lighting and flooring. 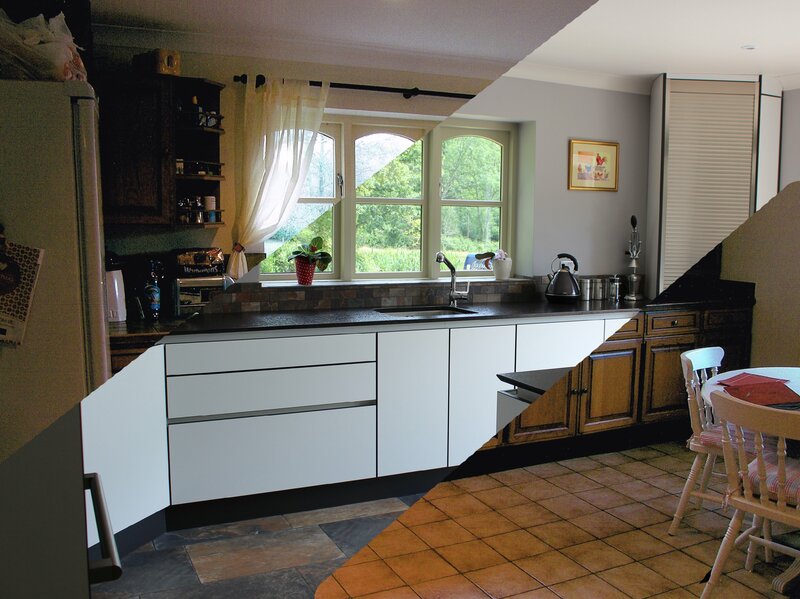 The whole process featured unexpected challenges with this kitchen, but not one of them could not be overcome and we were left with an extremely pleased and grateful customer! When our client originally came to our showroom he fell in love with one of our display kitchens by Kuhlmann, an excellent German supplier. 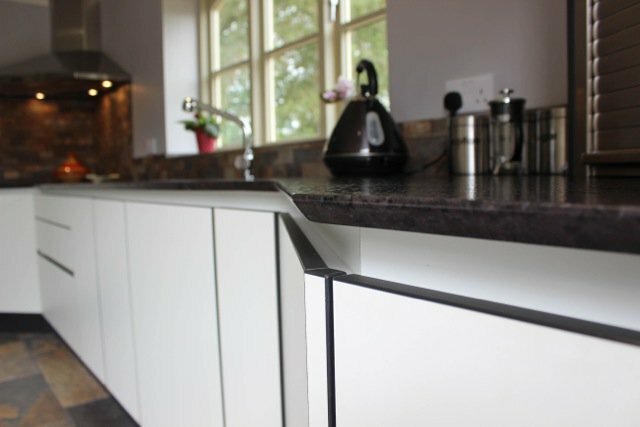 It was a white, true handleless laminate door with contrasting dark edging. Our first hurdle was that Kuhlmann were unable to produce some of the angled units that we required. 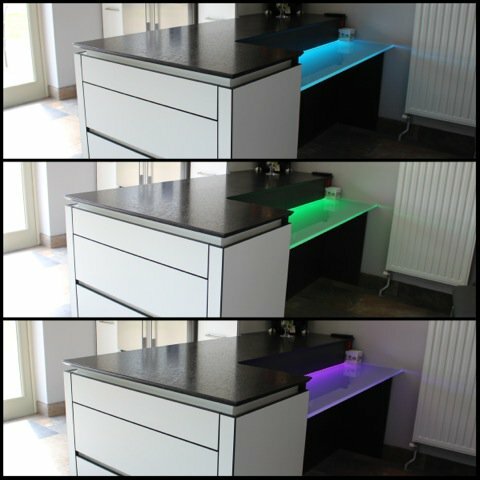 In our Ethos we mention, ‘Our service is bespoke and based entirely on your needs and vision’. This means that we will do out absolute best to find a way to get our clients what they want, because our products are not ‘off the shelf’ designs. 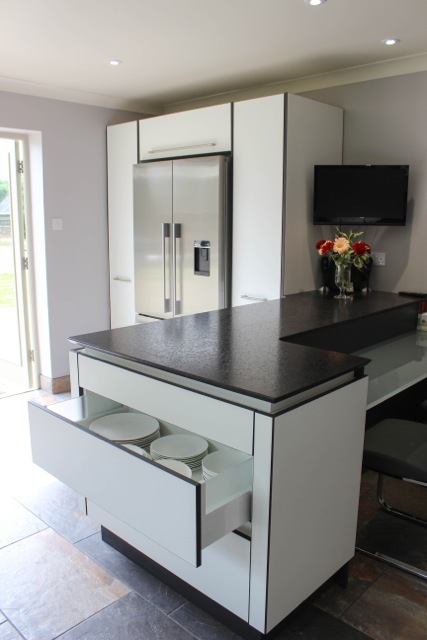 The issue in this particular kitchen was solved by designing the units ourselves to be identical to the German design and then having these manufactured in the United Kingdom. The original kitchen was extremely dated and needing a huge amount of renovation. Managing the project produced a number of unexpected issues, the first being the discovery that the floor was not sound and therefore not suitable for the new tiles that we were required to install. The floor had to be dug up and replaced with a new suspended wooden floor, followed by insulated boards, ready for the tiles to be laid on the top. 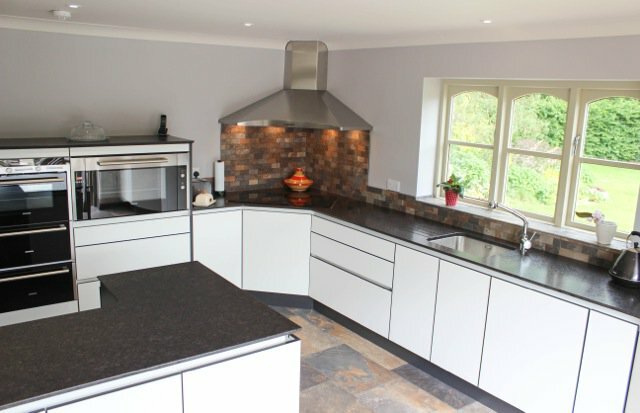 The property also produced a number of electrical issues that required a great deal of attention, but with a reliable team of workmen, we were able to overcome these problems and finally managed to begin installing the kitchen. Our client was and continues to be extremely pleased with his new kitchen and we still enjoy an excellent relationship with him.